Tesco is the clear winner in the online grocery market taking 50p of every grocery pound spent shopping on the internet. This high share is set to continue not just because of spending on fulfilment, dark stores, distribution, stock and offline marketing but due to its online visibility through organic search and a very visible well-structured website. The online grocery sector is worth £5.6bn (compared with the whole of the grocery market being worth £157bn). . The Guardian recently reported that as much as 15% of UK grocery sales, worth £900m, were online in the four days from 20-23 December, which shows there is a definite appetite for growth. Together with strong festive purchases, online grocery sales grew 19% last year and are predicted to more than double over the next five years to £13bn (see table below). It may seem obvious, but the well planned, 'big shop' happens more frequently online than the quick shop. When we spend more at the supermarket we are more likely to do it online. When we start talking about a £60 plus shop online sales accounts for 12% (as opposed to the overall 5%) of all checkouts whereas only 1% of checkouts with a value below £60 are purchased online. 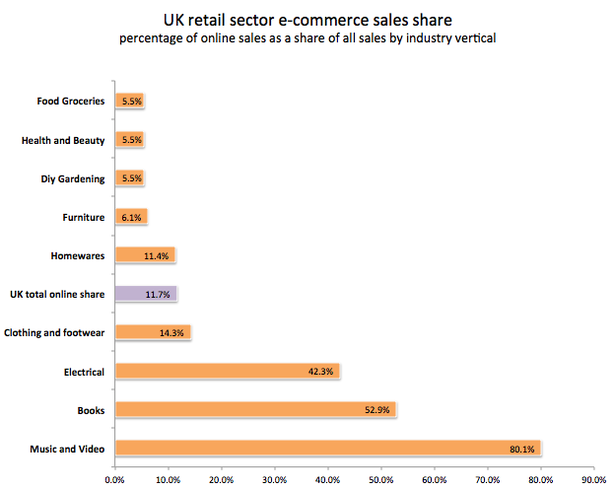 Plus the richer we are, the more likely we are to buy online. Those with an annual income of £60,000 or more spent 10p in every pound of their grocery shopping online. To therefore increase the online share of grocery shopping, supermarkets need to make the quick, small shop as much a part of the routine as doing the larger shop online as well as continue with the push for the big-shops. This can be reflected in their SEO. How do supermarkets use SEO to increase the little shop online? Not many people will search for 'apples' or 'bread' and then end up doing their shopping at the supermarket which comes out on top. This of course is probably true for normal shoppers, (though may not be for bulk buyers such as restaurants, hotels, pubs or other caterers - who will shop for single product bargains). However, we put an index of search terms together made up of all food stuffs and recipe ideas - it came to over 10m searches a month. Surely the supermarkets should be vying for that? It seems that some of the supermarkets are optimising for many, many food terms, and others are not. Cause or correlation, but the ones that are placed for multiple food terms and recipes are the ones that are doing best online - i.e Tesco. Why does Tesco have 50% of the online grocery market? In terms of organic search, that is being found in Google’s search results, Tesco is extremely dominant. I've created category specific indexes based on major search terms across the grocery sector eg frozen foods, online shopping, recipe ideas etc. The returning URLs for these keywords in Google’s search results are being tracked every day. As with the industry as a whole, Tesco is light-years ahead of the competition and it is no surprise that it has 50% of the ecommerce grocery market and is doing so well in the online shopping channel as its search positions dominate the sector. General supermarket (search terms include: online shopping, groceries etc). Mother and baby goods (baby milk, nappies etc). Fresh food and recipes (fresh pasta, fresh fruit, recipe ideas etc). Food cupboard (large marmite, pancake mix etc). Within these groups are around 2,500 search terms with a monthly search traffic, according to Google, of over 10m in the UK. This data indicates that Tesco is by far the most visible supermarket. In fact all the other major supermarket brands hardly feature at all outside the general supermarket indexes. (all data from Pi Datametrics). Table 1 shows Tesco’s dominance across over 700 common food terms. As people become more savvy in searching for best deals for their smaller shops, being well placed for the individual products is becoming ever more important for branding and acquisition reasons. Asda and Sainsbury’s are not even in the top ten most visible sites. However what seems to be shown from our data is that a non-traditional UK supermarket, Amazon is making in-roads on the traditional players. With well renowned next-day delivery it is Amazon who could start making gains in the small, cheap shop. In Table 2 we see more of the main supermarkets perform better and compete with Tesco who just about retain first place. 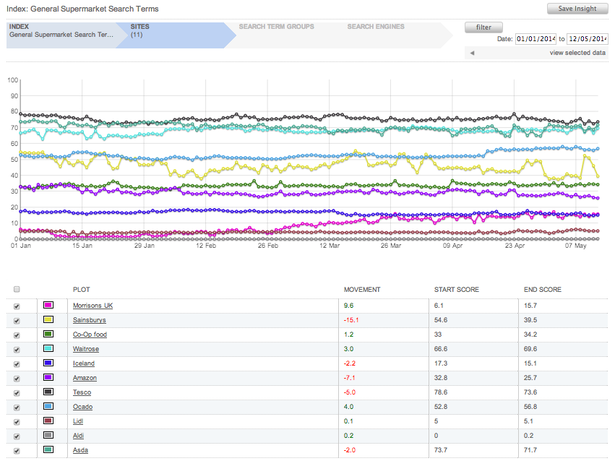 Asda and Waitrose are vying for second place in terms of average Google position. Both those sites have pushed hard in the last 12 months. 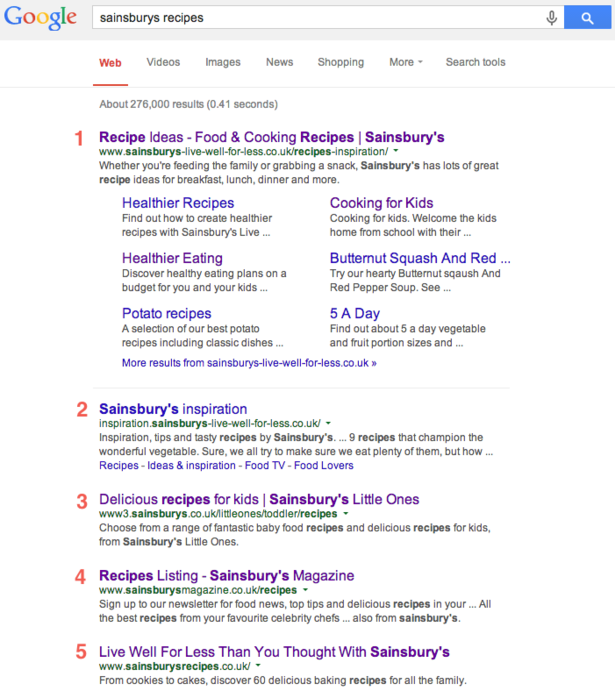 Sainsbury’s, though visible for all the search terms in this general category, its average position is relative poor and considering the small batch of search terms in this index is not in the conversion zone enough. Surprisingly two major newspapers, The Guardian and The Daily Mail are visible for these major category searches. Their visibility in Google is extremely dominant across all sectors and are in that sense an online competitor to many brands. Below we see the movement between the major supermarket players for these general supermarket terms. We have given supermarkets wieghted points depending on their positions for the major terms in google. It's a three horse race with Asda winning at Christmas, and Tesco just leading now. Some of these searches are aligned to recipe ideas, hence the high visibility of the BBC, Jamie Oliver's, and Delia Smith’s website. Offering recipe content onsite is not a strategy lost on the major supermarkets, in fact all the main players offer recipe ideas or content based around fresh food, but it seems the strategy is not being executed as well as possible. This spread and dilution of content could therefore be the issue. If the recipes were concentrated in one area then the site could gain more strength and indeed less duplication, thus aiding the user and the search engine. The most powerful aspect of Tesco is that it reflects the diversity of the large store offering with its online offering. The visibility across non-food searches is as good as it is across the grocery searches above. And if this means having presence in front of 150,000 mothers looking for baby products (who may also want to do addtional shopping) then this is well worth the investment. One would have thought that Boots or Mumsnet would have the products and content to have the most powerful websites for their own sector, but no Tesco is supreme in this area too. This performance is replicated across many other areas too including electrical products and online videos, where the purchase of Blinkbox is positioned to compete with Netflix. It is the dominance in the grocery sectors plus its diversity online combined with offline fulfilment that will see Tesco continue with its supremacy for some time to come.